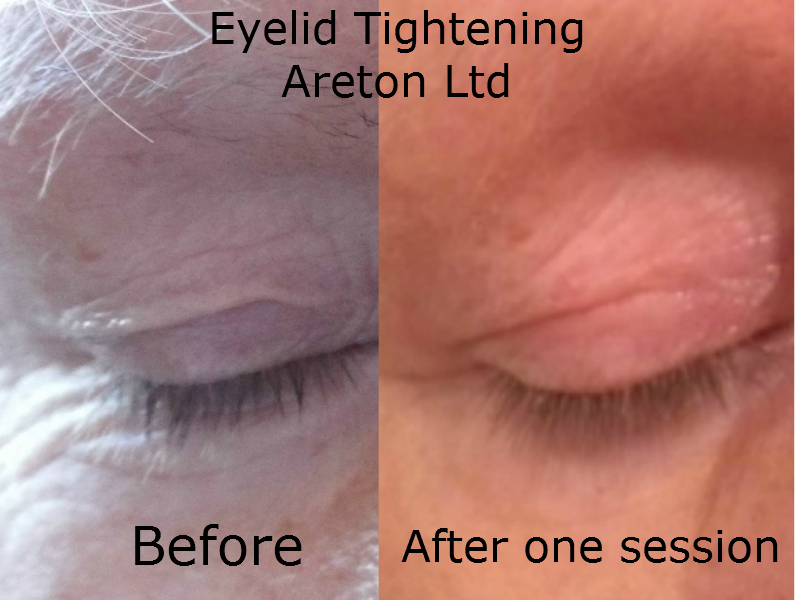 Areton Limited > Eyelid Tightening. The BeautyTeck is the new frontier in Eyelid Rejuvenation. This technique has been used and tested extensively throughout the world. Eyelid tightening is extremely easy and safe with the BeautyTeck. Eyelid tightening using plasma (or an electronically generated electrical discharge) is the new frontier in aesthetics. This type of localised skin tightening has been extensively performed on both upper and lower eyelid. Voltaic Plasma is a revolutionary innovation in aesthetic which allow the aesthetic practitioner to achieve outstanding results. Voltaic Plasma generated by the BeautyTeck® enables the aesthetic practitioner to achieve cumulative comparable results to procedures which could previously be achieved through surgery, opening a new and exciting frontier in the field of Aesthetics. Te procedure itself is very simple and it has been expensively performed though the world using The Plasma BeatutyTeck®. The Beatutyteck® offers an effective alternative option to certain surgical eyelid lift procedures. Eyelid Tightening results after one treatment using the BeautyTeck®. In the picture above it is easy to appreciate how the droopy skin has tightened after only one session with the BeautyTeck®. The tightening effect is cumulative, therefore repeating the procedure improves results over and over until achieving the desired aesthetic results. This aesthetic procedure is very easy to carry out and safe, it has been extensively tried and tested in the UK and throughout the world. There are several video example on The BeautyTeck Channel showing how eyelid tightening is carried out. The beauty practitioner applies a numbing product on the eyelids. This is left between 15 minutes to 45 minutes depending on the type of numbing product used. It is also possible to carry out this aesthetic procedure even without the use of any numbing agents, however the discomfort and pain which some people can experience, makes the use of the numbing products advisable for ease and comfort reasons. The beauty practitioners are explicitly instructed not to use any injectable local anaesthetics which are not necessary for this aesthetic procedure. The technique normally used for this easy aesthetic procedure is referred to as “the spot mode”. Tiny bursts are applied on your eyelid. The distance between each spot, the voltaic arc duration and the power level of the device determines the overall intensity of the treatment and hence the end results. Sometimes very experienced users also use a spray technique for this procedure. In the video above you can see how the “spot mode” was applied in such a way that it seems almost as if the device was being used in “spray mode”. The downtime in this case was only 2 days and the swelling, typical of this aesthetic procedure, was very mild the day after the treatment and subsided altogether two days after the treatment. This short downtime was due to the medium intensity treatment and the use of an appropriate soothing product, applied immediately after the treatment. Additionally the after-care was followed religiously by the client. This particular procedure was videoed to show the difference between an eyelid treated with the BeautyTeck and the one that wasn’t. Many more similar videos are in our archives. Very likely your beauty practitioner will opt for very mild treatments as this is the way they are instructed to use the equipment for this type of procedure. If you are interested in having eyelid tightening done, using the BeautyTeck, please do not hesitate to contact us.